Many of the classic desktop programs out there support multiple instances. For instance, you can open multiple instances of Notepad and Word programs. In plain English, it’s just that you can open multiple windows of the same program. For instance, let’s suppose that you are jotting down an important note in Notepad and at the same time, you want to open a previously created note with Notepad without closing the current window of Notepad. The feature also comes in handy when you want to compare two documents side-by-side. To open another instance of a supported program, you just need to launch the same program which is already running. 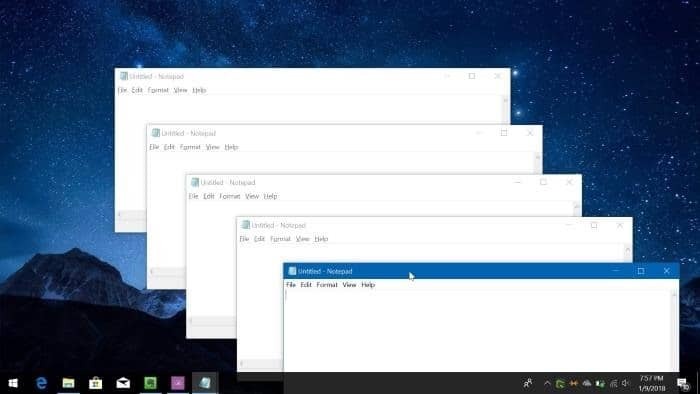 For instance, to open multiple instances of Notepad, you first need to open the Notepad by typing its name in the Start/taskbar search and then hitting the Enter key. Enter a text or two (no need to save). Once the first instance of the Notepad is running, use the same method or any other method to open the second instance of Notepad. You can open any number of instances of a supported program. Sometime back, we had covered how to quickly open another instance of a program by holding down the Shift key and then clicking on the taskbar icon of the program. It seems that there is another way to open multiple instances of a supported program much faster. You can simply perform a middle-click on the program’s taskbar icon to open another instance of the program. And if you cannot open multiple instances of a program using the middle-click method, it’s likely because the program doesn’t support multiple instances. It could also be because you have changed the default behavior of the middle-click. In that case, please review your mouse software settings to configure the middle-click again. Between, did you know that there is a workaround to open multiple instances of Windows Media Player which doesn’t support multiple instances by default?